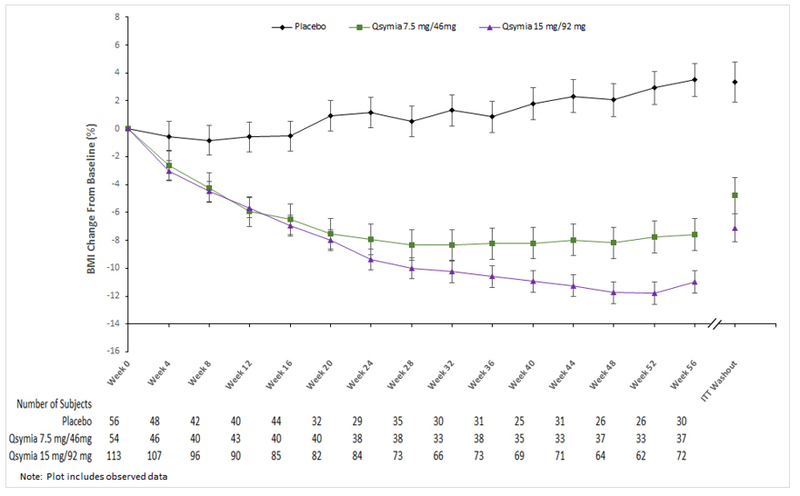 Upon oral administration of a single Qsymia 15 mg/92 mg, the resulting mean plasma phentermine maximum concentration (C max), time to C max (T max), area under the concentration curve from time zero to the last time with measureable concentration (AUC 0-t), and area under the concentration curve from time zero to infinity (AUC 0-âˆž) are 49.1 ng/mL, 6 hr, 1990 ngâˆ™hr/mL, and 2000 ngâˆ™hr/mL, respectively. A high fat meal does not affect phentermine pharmacokinetics for Qsymia 15 mg/92 mg. Phentermine pharmacokinetics is approximately dose-proportional from Qsymia 3.75 mg/23 mg to phentermine 15 mg/topiramate 100 mg. Upon dosing phentermine/topiramate 15/100 mg fixed dose combination capsule to steady state, the mean phentermine accumulation ratios for AUC and C max are both approximately 2.5. Upon oral administration of a single Qsymia 15 mg/92 mg, the resulting mean plasma topiramate C max, T max, AUC 0-t, and AUC 0-âˆž, are 1020 ng/mL, 9 hr, 61600 ngâˆ™hr/mL, and 68000 ngâˆ™hr/mL, respectively. A high fat meal does not affect topiramate pharmacokinetics for Qsymia 15 mg/92 mg. Topiramate pharmacokinetics is approximately dose-proportional from Qsymia 3.75 mg/23 mg to phentermine 15 mg/topiramate 100 mg. Upon dosing phentermine 15 mg/topiramate 100 mg fixed dose combination capsule to steady state, the mean topiramate accumulation ratios for AUC and C max are both approximately 4.0. • A single study examined the effect of multiple-dose Qsymia 15 mg/92 mg once daily on the pharmacokinetics of multiple-dose 500 mg metformin twice daily and multiple-dose 100 mg sitagliptin once daily in 10 men and 10 women (mean BMI of 27.1 kg/m 2 and range of 22.2 â€“ 32.7 kg/m 2). The study participants received metformin, sitagliptin, phentermine/topiramate only, phentermine/topiramate plus probenecid, phentermine/topiramate plus metformin, and phentermine/topiramate plus sitagliptin on Days 1 â€“ 5, 6 â€“ 10, 11 â€“ 28, 29, 30 â€“ 34, and 35 â€“ 39, respectively. • The same single study examined the effect of multiple-dose 500 mg metformin twice daily, a single-dose 2 g probenecid, and multiple-dose 100 mg sitagliptin once daily on the pharmacokinetics of multiple-dose phentermine/topiramate 15 mg/92 mg once daily in 10 men and 10 women (mean BMI of 27.1 kg/m 2 and range of 22.2 â€“ 32.7 kg/m 2). The study participants received metformin, sitagliptin, phentermine/topiramate only, phentermine/topiramate plus probenecid, phentermine/topiramate plus metformin, and phentermine/topiramate plus sitagliptin on Days 1 â€“ 5, 6 â€“ 10, 11 â€“ 28, 29, 30 â€“ 34, and 35 â€“ 39, respectively. • Plasma concentration increased 25% in some patients, generally those on a twice a day dosing regimen of phenytoin. 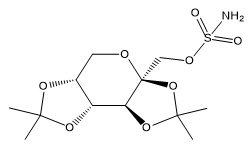 • Is not administered but is an active metabolite of carbamazepine. A drug-drug interaction study conducted in healthy volunteers evaluated the steady-state pharmacokinetics of topiramate (96 mg twice daily) and pioglitazone (30 mg daily) when administered alone and concomitantly for 7 days. A 15% decrease in the area under the concentration-time curve during a dosage interval at steady state (AUC Ï„,ss) of pioglitazone with no alteration in maximum steady-state plasma drug concentration during a dosage interval (C max,ss) was observed. This finding was not statistically significant. In addition, a 13% and 16% decrease in C max,ss and AUC Ï„,ss respectively, of the active hydroxy-metabolite was noted as well as a 60% decrease in C max,ss and AUC Ï„,ss of the active keto-metabolite. The clinical significance of these findings is not known. • Uses all available data from subjects in ITT population, including data collected from subjects who discontinued drug but remained on study. Last Observation Carried Forward (LOCF) method used to impute missing data. 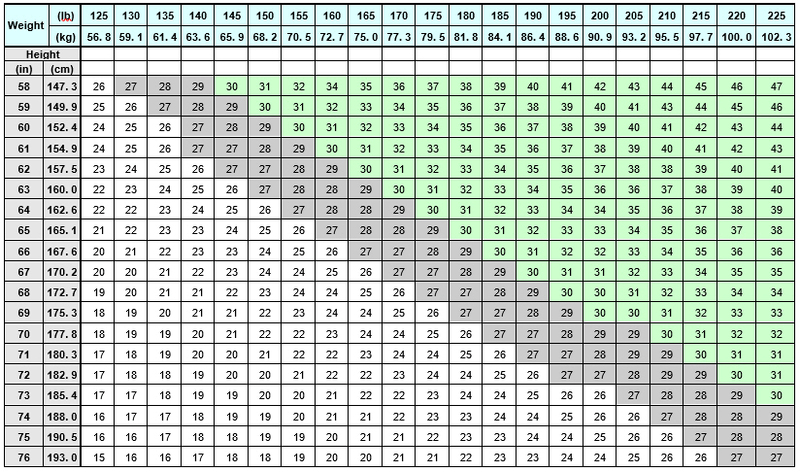 • Adjusted for baseline bodyweight (Study 1) and baseline bodyweight and diabetic status (Study 2). • p < 0.0001 vs. placebo based on least-squares (LS) mean from an analysis of covariance. • p < 0.01 vs. 3.75 mg/23 mg (Study 1) or 7.5 mg/46 mg (Study 2) dose.